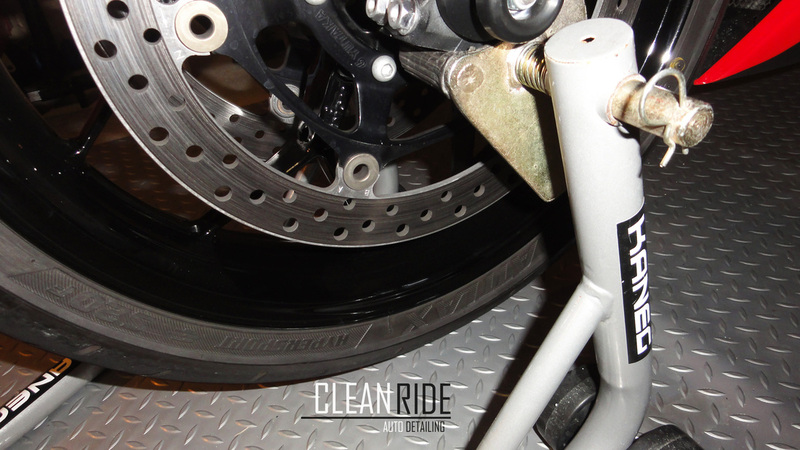 Wheels would have to be the hardest part on a motorcycle to keep clean, with the front wheel covered with 2 huge discs normally and the rear just plain covered in brake dust and all sorts of grease, tar and road grime they can be a real hassle to keep clean and most just give up. This guide will show you how to apply the Swissvax Wheel kit and end your frustrations along with having wheels that stay cleaner for longer they are also so easy to maintain that a damp cloth is all you will need for up keep. Now what is different about this kit compared to everything else on the market? Well firstly it comes with a heavy duty peppermint cleaner that can cut through the grease and grime but is gentle enough not to damage any powder coated, anodized or chrome your wheels my be finished in, it just sprays on and strips the dirt, grit and road grime like nothing else and is safe on all types of wheels including brakes. The kit comes completed with a paint cleaner that will open the pores to allow the specialized wax called Autobahn to be added, this is the secret to this kit, a wax that is designed to take heat and not melt off along with the added protection of PTFE so grit and dust does not stick to the finish, the wax has a high melting point of 327 deg C so it does not melt away while your riding. 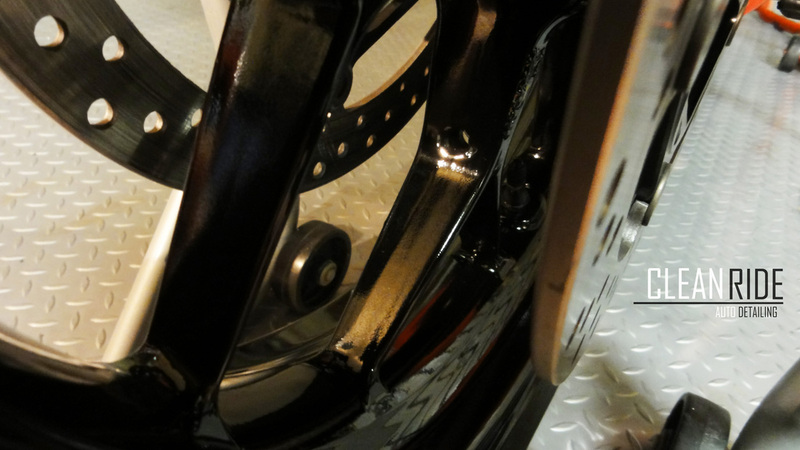 But the main advantage of using the system is it will cut your cleaning time down to a third of the time and your wheels will always look there best no mater what your riding through. - Please read the disclaimer at the bottom of the page before proceeding. The first step is to get set up the concentrate wheel cleaner and water mix using the mixing bottle provided. Start off with a 1:1 mix so pour the cleaner up to the #1 mark then top up to the #2 mark with water and mix. Fill two buckets with cold water and drop the Yellow Wash cloth in one bucket, this will be your "clean" water bucket and add a few drops of wheel cleaner to this, now get your Motorcycle set up saftley and securely on stands so the wheels can be turned freely. At this point you want to have a water hose set up along with your two buckets, mixing bottle complete with wheel cleaner along with your two brushes. Now we are ready to begin the cleaning part of the process, only ever work in the shade and always have a water hose ready to rinse, never let anything dry on your wheels in the sun, this is a No-No. Work on one wheel at a time and start by hosing down the wheel with just plain water to get rid of lose dirt then spray the cleaner directly onto the wheel and agitate it with the brushes supplied, rinse the wheels often to wash away the dirt and dip your brushes into the "Dirty" bucket then into the "Clean" bucket and back onto to the wheel, this will mean your pushing less dirt around that can scratch 2 pack and powder coated coated wheels. After we have sprayed and agitated the wheels with the brushes we need to rinse it off, if there is still heavey dirt you may need to repeat this process several times before moving on as. Once you are happy move onto to yellow Swissvax Wash cloth, this will pick up anything that has been left behind by the brushes, it uses tiny hairs to collect any dirt left behind,make sure you rinse the cloth in the "dirty" water bucket and then use the "clean" water bucket to re apply and clean the wheels. After this has been done rinse and dry off the wheels with a microfiber cloth or chamois, we prefer a micro fibre cloth as is softer and easier to manoeuvre though tight spots. Once your wheels are totally dry we are ready to clean the paint finish so it can accept the Autobhan wax an give it a better surface to "grip" onto. Pour a tiny 5c peice amount of Swissvax Paint Cleaner on the soft white pad and wipe over small sections of the wheel at a time and let stand for no longer than 10 seconds, this part must never be applied in direct sunlight ever, remember a cool dry spot and wipe off with a microfiber cloth. Once the entire wheel has been treated go over the wheel again with a new clean micro fibre cloth and buff to a high shine and we are now ready for the wax. We need to wax the wheels to lock in the deep shine that the paint cleaner has left along with adding a barrier so dirt and grit can not stick to the surface making upkeep a whole lot easier. There are two options in applying this specialized wax, one by the tips of your fingers and the other is on a pad, the choice is yours, the key here is to use very little and to smear it on like a thin layer of grease, this product is highly concentrated, one tiny little tub will be enough to coat 40 wheels at a minimum, just rub the product in the jar and smear onto the wheels and let is stand for 10 minutes, , we also recommend 2 coats of the wax as the second makes sure nothing has been missed. Once the wheels are covered in wax and has sat for 10 minutes start wiping off the wax with a microfiber cloth working in sections and going back and forth and turning over the cloth so it does not get clogged up. Once complete go over with another clean microfiber cloth and buff to a high shine. Now all that is left to do is leave it out in the sun for 15-20 minutes, this will heat the wax up and it will stick to the paint work and lock in that deep wet look and you are done! Now all you need to do is sit back and look at how good your wheels look! What you will really enjoy is how easy it will be to maintain and clean these wheels so they look great all the time. 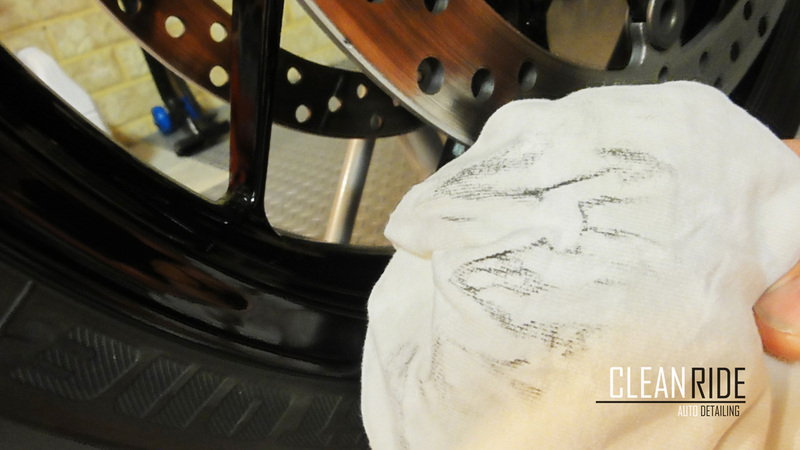 Once they have been covered in dust and grime from riding it is just a matter of wetting a damp microfiber cloth and wiping over the wheels, becase they now have a coating of heat proof wax enriched with PTFE that is repelling dust and dirt there is far less chance of grit sticking and messing up the general appearance. Below is what dust and dirt came off a set of wheels that were treated with the Swissvax Wheel kit, the test was run on a race track in 40 deg C day with track temps exceeding 75 deg C , a minimum 30 laps of the Barbagallo race track was completed and as mentioned this is a heat stable wax that can take temperatures up to 327 Deg C along with the PTFE properties it stood up to the task as you can see. The wax had been on the wheels for 4 weeks prior to the test and has now had two applications of wax in 7 months and still going strong today, not to mention how quick and easy it is to clean and maintain the shine and keep them looking better than new. Order your kit today or those that have already have purchased a Swissvax Bike kit contact us for your special add-on package . Although the author and publisher have made every effort to ensure that the information in this guide is correct , the author and publisher do not assume and hereby disclaim any liability to any party for any loss, damage, or disruption caused by errors or omissions, whether such errors or omissions result from negligence, accident, or any other cause. The material in this guide may include information, products, or services by third parties. Third Party materials comprise of the products and opinions expressed by their owners. As such, the authors of this guide do not assume responsibility or liability for any Third Party Material or opinions. The publication of such Third Party materials does not constitute the authors’ guarantee of any information, instruction, opinion, products or service contained within the Third Party Material. Use of recommended Third Party Material does not guarantee that your results, with this guide will mirror our own. Publication of such Third Party Material is simply a recommendation and expression of the authors’ own opinion of that material. Whether because of the general evolution of the Internet, or the unforeseen changes in company policy and editorial submission guidelines, what is stated as fact at the time of this writing, may become outdated or simply inapplicable at a later date. This may apply to the website platform, as well as, the various similar companies that we have referenced in this eBook, and our several complementary guides. Great effort has been exerted to safeguard the accuracy of this writing. Opinions regarding similar website platforms have been formulated as a result of both personal experience, as well as the well documented experiences of others. No part of this site shall be reproduced, transmitted or resold in whole or in part in any form, without the prior written consent of the authors. All trademarks and registered trademarks appearing in this guide are the property of their respective owners.